Are you looking for a Affordable timeshare liquidation services? Look no further than Redemption and Release. We have developed a business model that gives us flexibility to offer our clients a superior service that saves them thousands of dollars by permanently removing their timeshare ownership obligations. Our methods are guaranteed and have aided thousands of consumers reach timeshare freedom. You may have heard about other timeshare cancellation methods like timeshare donation, timeshare aid or resale websites but companies that run those types of operations are only out to take your money and cause you more financial heartache. Details about our time share liquidation services can be found below. Here at Redemption and Release we always have the timeshare owner’s best interest in mind. We hear many different timeshare ownership stories and offer FREE advice on the best ways to permanently get out of your timeshare. When you fill out a form, a timeshare liquidator expert will walk you through your FREE timeshare consultation and decide if you qualify for our liquidation services. Once you have been accepted into the liquidation program, you will be assigned a dedicated case manager that will be assisting you with every step on your way to timeshare freedom. This dedicated case manager will be sending you a packet with detailed instructions of the information and documents that we will be needing from you in relation to your timeshare ownership. When you send back the documents it will be processed by our licensed, bonded and insured title office. Once we go to work on your timeshare contract you will soon receive new ownership documents recorded and recognized at the courthouse. These courthouse recorded documents will be your ticket to timeshare FREEDOM. You will also be receiving a call from your dedicated case manager to congratulate you on reaching timeshare freedom and leaving all headaches of your timeshare ownership behind. 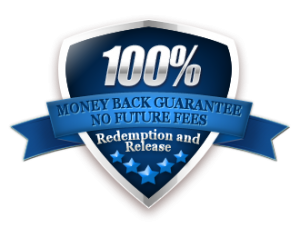 We have spent over five years perfecting our timeshare liquidation service and we are so confident that it will permanently get you out of your timeshare that we offer two 100% money back guarantees. The first guarantee ensures legal and permanent transfer of ownership from your name of ownership. If for any reason your legal obligations to the property are not terminated The second 100% money back guarantee ensures that once you have made it through the liquidation process that you will not be obligated to pay any future fees associated with your previous timeshare ownership. To learn more about what our timeshare liquidation company has to offer contact us today!